Update: Samsung Galaxy S8 (SM-G950F/FD) and S8+ (SM-G950F/FD) devices are now receiving August 2018 Security Patch based on Android 8.0 Oreo. Apart from the latest Android Security Patch, it features improvements to the camera quality, device stability improvements, bug fixes, new and enhanced features, and further improvements to performance. The new August Patch somes with firmware build numbers G955FXXU3CRGH and G950FXXU3CRGH respectively. Whereas, the previous Android 8.0 Oreo builds were G950FXXU2CRED and G955FXXU2CRED for S8 and S8+ respectively. The OTA weighs around 513.41 MB and is based on Baseband version G950FOXM2CREB and CSC as G950FXXU2CRE3. 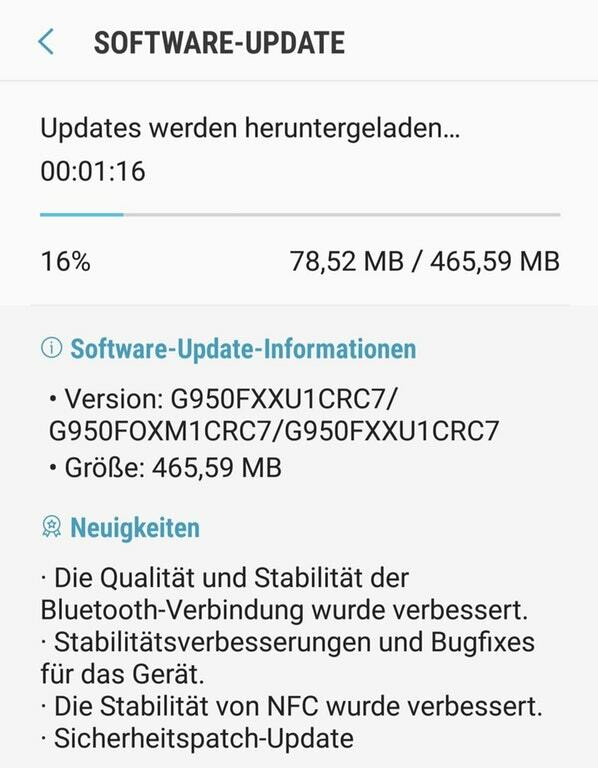 We have already received April 2018 Security Patch OTA update with firmware build numbers G950FXXU1CRD1 and G955FXXU1CRD1 respectively last month. The OTA is live across the globe in Europe, USA, Asia, Canada, Australia, etc. Following successful deployment of Android 8.0 Oreo based Samsung Experience 9.0 firmware, it is time to polish the existing ROM. Hence, the manufacturer released a couple of OTA updates. Today, a lot of Galaxy S8 and S8+ users are receiving March security update as well. It features the new CRC7 build number as opposed to the CRB7 from February. As of now, only the Galaxy S8+ users are able to receive the OTA notification. 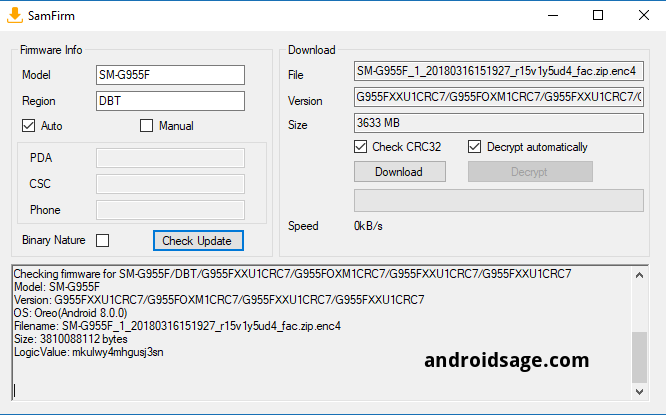 So download and install Galaxy S8 (Plus) CRC7 Odin firmware. The Samsung Galaxy S8 and S8 Plus global variants are now receiving the latest March 2018 Android Security Patche. This comes with new firmware build numbers G955FXXU1CRC7 and G955FXXU1CRC7 for the SM-G955F/FD and SM-G955F/FD respectively. The OTA is currently only rolling out in European countries like Germany. Other countries in Europe and Asia will soon receive the same. So you can either wait for the OTA to arrive or download the full stock firmware from below. The OTA weighs over 570 MB in size and brings several bug fixes, vulnerability patches from March AOSP sources. Apart from the AOSP changelog, Samsung-only bug fixes are related to Bluetooth improvements, and NFC. How to download and install Galaxy S8/S8+ August 2018 Security Patch Odin firmware? Samsung has pulled off the update. You should inform that. There is no March update from the Samsung servers. So if you are in CRB7 you are in the last update.